On 21st December, hundreds of visitors from all over the world with gather at Stonehenge to mark the Winter Solstice, watching the sun rise over the world-famous stones. 21 December 2013 At dawn, the central Altar stone aligns with the Slaughter stone, Heel stone and the rising sun to the northeast, creating one of the most spectacular sights of the year. The event marks the point at which the majority of wine and beer was ready to drink and the cattle was soon to be harvested; becoming a huge celebration. And today is no different. Attracting locals, families, tourists and party goers, the Winter Solstice at Stonehenge has become one of the year’s most popular events. But this particular tour has been granted private access by the English Heritage, meaning visitors will get the chance to experience the stones before the masses arrive. 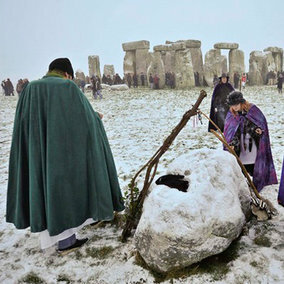 Leaving London at the crack of dawn, the tour arrives with time to spend two hours inside the circle before the area is closed off to the public, and witness the sun rising, along with the traditional Druid ceremonies and festivities the Winter Solstice brings. The council in Windsor is looking at ways it can benefit from tourism. The news comes after a tour company said last week it would no longer bring visitors to the town due to parking problems. At a meeting last night a forum agreed to explore how they can increase the time holiday-makers spend in Windsor. The suggestion follows changes at ancient Stonehenge. The attraction in Wiltshire is in the process of a £27m project. The changes include a 10-minute shuttle from a new visitor centre being built 2km from the stones. This means it will require a significantly extended visit time for tour operators. At the Royal Borough’s visitor management forum, members said tour firms take visitors on whistle-stop day trips around the UK only spending a few hours in Windsor, before moving on to attractions such as Stonehenge. Instead they want people to stay in Windsor all day, overnight or longer. They said tourists are rushed up to Windsor Castle and back – without visiting other attractions or the town centre – and they want people to have a ‘better and more rounded experience’. Ideas suggested include improving the route from Windsor Coach Park, in Alma Road, to Windsor Castle, giving the park a facelift and creating a ‘my favourite or perfect day’ borough itinerary. Chairman Cllr Alan Mellins (Con, Cox Green) said changes at Stonehenge may force tour operators to adapt their itineraries and spend more time in Windsor because Stonehenge is harder to be completed quickly. Vice-chairman Cllr Andrew Jenner (Con, Maidenhead Riverside) said it does not matter ‘how pretty’ Windsor is – it was about changing the ‘mind set’ of operators. They suggested day trips combining Windsor with just Oxford or Hampton Court, rather than with Bath, Salisbury, Stonehenge. – Last year between 1.2-1.5 million visitors came through Windsor Coach Park in Alma Road. – Money made from the tourist coaches coming to Windsor was said to be worth about £22million to the borough’s economy. – The average time spent by a visitor to Windsor is two to four and a half hours. – Top tourist enquries to http://www.windsor.gov.uk in 2012 were Windsor Castle with 992,652 views, and Changing of the Guard with 55,030. – The top events people searched for in 2012 were the Armed Forces Muster and Parade and Ascot Carriages – carriage rides through the Royal Landscape. – Press coverage of the Royal Borough in 2012 reached over 145 million people and was valued at half a million pounds. – Windsor is home to two of the UK’s Top 20 visitor attractions – Windsor Castle and Legoland. Tours from Antiquity have released a new Archaelogy Tour for 2013. The ultimate weekend excursion from London. Offering the best of British in a relaxed and well-paced holiday. Some of the most imposing architecture and mysterious ancient monuments in the world, certainly within the United Kingdom. These sites coupled with the beautiful Wiltshire and Oxfordshire countryside offer the participants of this holiday a special and unique experience. Special Access to the Stonehenge Circle. 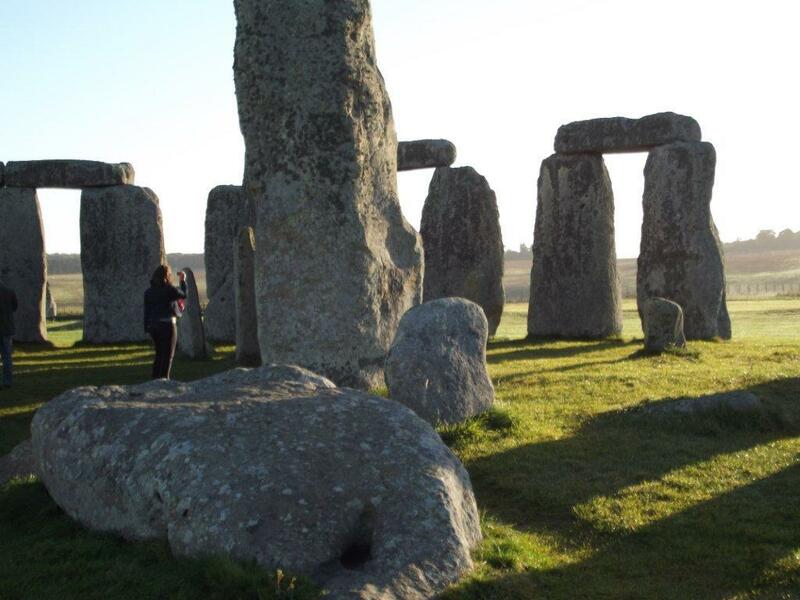 Stonehenge, Prehistoric Wessex, Bath and the Cotswolds tour introduces our guests to some of the most imposing architecture and mysterious ancient monuments in the world, certainly within the United Kingdom. These sites coupled with the beautiful Wiltshire and Oxfordshire countryside offer the participants of this holiday a special and unique experience. Our holiday is original, imaginative, well-paced and carefully balanced. Knowledge of the subject matter provided by our archaeologist and the destinations combine with detailed attention to practical matters, ensure an enriching and smooth-running experience. Coupled with the archaeology, TFA holidays offer our participants immersion into the English countryside, focussing on local tradition, culture, archaeology, heritage, landscapes and food and drink. From London we start our tour with the ancient rolling downlands Oxfordshire and a visit to the internationally-renowned Bronze Age Uffington White Horse, situated within a unique complex of ancient monuments. Our afternoon is spent enjoying two of Englands most picturesque villages, Lacock and Castle Combe. Lacock has been used as a background film set for films including Harry Potter and Castle Combe is regarded by many as the prettiest village in England. Lunch is spent in Salisbury where we enjoy the splendour of Salisbury Cathedral. The afternoon is spent exploring landscape directly surrounding Stonehenge on Salisbury Plain. We start by visiting Durrington Walls ‘Stonehenge builder’s village’ and Woodhenge, we then walk over the ridge visiting several burial mounds, Stonehenge Cursus and finally the Stonehenge Avenue. The day is finish with a private access visit to Stonehenge, an opportunity limited to a handful of visitors, were our archaeologist will delve into understanding this enigmatic and ancient monument. We start our visit to the centre of Bath with a walking tour of the most impressive examples of architecture Bath has to offer, visiting the Assembly Rooms, Royal Circus and Royal Crescent. Our guest then enjoy admission to the famous Roman Baths, the site of the only thermal springs in Britian. After you enjoy the splendour of the Baths, you are given amble ‘own time’ to explore the remainder of this city at your own pace. Finishing the day with a visit to the National Trusts, Prior Park; with its beautiful views of the city-scape of Bath. From here we head back towards London. As one of the country’s most famous World Heritage sites most visitors are not allowed direct access to the stones, but we have arranged with English Heritage for privileged access before or after the site opens to the general public between April and September only. Stonehenge Guided Tours, the operator twin the special access visit with Salisbury for morning visits and Avebury for evening tours. The tour starts and finishes in Central London. The special access visits are either earaly in the morning or in the evening outside public opening hours. There are different itineraries depending on the time of your visit. Sonehenge Guided Tours, the operator twin the special access visit with Salisbury for morning visits and Avebury for evening tours. After the special access visit a short drive is taken through the beautiful Woodford Valley. Next stop will be at Salisbury Cathedral, where you will have free time to explore this beautiful and historic medieval Cathedral. Price includes Special Access to Stonehenge, Salisbury Cathedral and English Breakfast plus of course the services of the guide. Before the special access visit a visit is made to Avebury, another henge and much else Neolithic besides. A great training camp for Stonehenge itself. Also walk up the hillside to West Kennet Long Barrow one of the largest Neolithic burial tombs in Britain and over 5000 years old. Price includes Special Access to Stonehenge, expert guided tour of Avebury and West Kennet Long Barrow and a pint at the Red Lion Pub. As the sun begins to set, we enter the stone circle (which is normally roped off to the public) for a unique private viewing. The most dramatic and atmospheric way of visiting Stonehenge. Stonehenge Private Access Tours – Go beyond the fences! 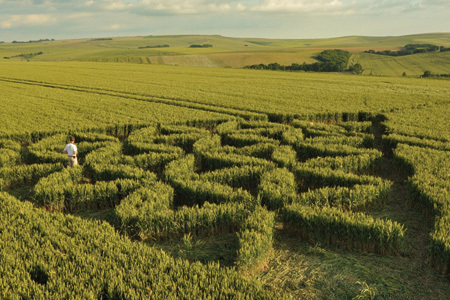 Weird Wiltshire: From mystical Stonehenge to crop circles and ancient burial sites. Simon Heptinstall from London’s TNT Travel Magazine visits Wiltshire. Wiltshire is surely an epicentre of oddities. From inexplicable crop circles to mysterious prehistoric sites, this quintessential slice of unspoiled England is one of the most baffling and interesting places on the planet. I’m intrigued by the countless tall tales I’ve heard, and decide the best place to start a tour of weird Wiltshire has got to be Stonehenge. Theories abound as to how the massive stones – some weighing as much as 50 tonnes – came to be arranged in ancient times. Were they gifts from extraterrestrial beings? Magically transported through a wave of Merlin’s wizardly wand in the times of King Arthur? Or simply heaved into place by tough primeval men, for use as an astrological calendar? A £7.80 ticket buys you access to the perimeter of the stones, but rather than stump up that cash, I find a signposted National Trust walk, which loops around the surrounding fields. From here I can still see the famous stone circle and also get a satisfying sense of its place in the ancient landscape of avenues and fields. A short drive from Stonehenge, through rolling chalky hills, takes me to its lesser-known Stone Age neighbour, Avebury, one of the biggest prehistoric sites in Europe. Its sprawling inner and outer stone circles were formed for some long-forgotten purpose, and are connected to the nearby town via a grassy ‘avenue’. This is marked by pairs of large grey stones and leads past ramparts, ditches and tombs. Naturally, such a mystical scene attracts all the nutters, and I pass groups of beardy druid-types hanging around the various rocks, muttering what sound like charms or spells to themselves. One old hippy tells me a local legend: if you press your ear to a stone you can hear voices from the past. I test his theory and strain to catch a whisper from anyone, a Pagan god perhaps, or just a long-deceased worshipper, but eventually give up – his hearing must be better than mine. Avebury is a real hotbed of quirky old sites. A short walk away is Silbury Hill – a chalk lump of 40m high, it’s the tallest man-made mound in Europe, comparable in size and age to some Egyptian pyramids. Its purpose is again unknown – there’s a definite trend here – but legend has it there’s a man on horseback and covered in gold buried in its heart. Archaeologists have been tunnelling into the mound for years, though, and haven’t found anything yet. 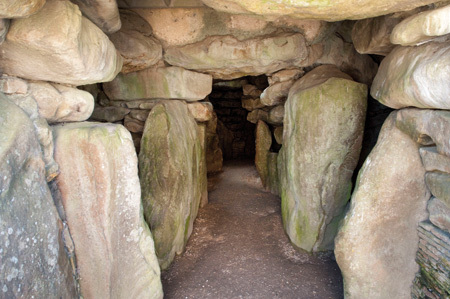 Constructed around 3650BC, this atmospheric chamber was in use for at least 1000 years, until it was sealed with chalk rubble and boulders. 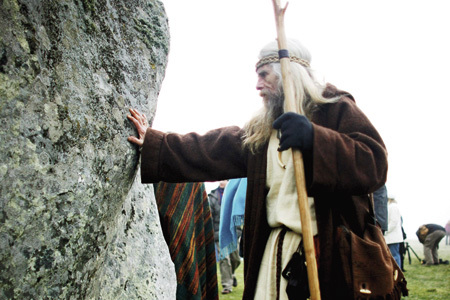 Some archaeologists believe this happened at the same time the stone circles at Avebury were built, indicating a dramatic change in beliefs or religion. Deep inside the chamber, I can’t resist letting out a ghostly “woooh”, which echoes around the old stones. I’m quickly shushed by a serious-looking spiritualist kneeling on the ground nearby. Time to call it a day. The next morning I check out Wiltshire’s eight white horses, landmark figures carved into the side of chalk hills. No mystery here though, they were formed by eccentric landowners just a few hundred years ago. One of the most spectacular, at Cherhill, was designed in 1780 by Dr Christopher Alsop, known as ‘the mad doctor’, who shouted directions to its makers through a megaphone from the bottom of the hill. Finally, I clamber to the top of Westbury Hill to get a view of the intricate crop circles in the fields below. From geometric patterns to swirling circles, some of these appeared as recently as last month, yet as little is known about their origin as about Stonehenge’s. One thing is clear though – Wiltshire shows no signs of getting any less weird over time. For top-notch veggie fare, head to the Circle Restaurant (High St, Marlborough, tel. 01672 539514 ). Sandwiches, soups and cream teas are the order of the day. Mains from about £5. The Red Lion is a classic old thatched country pub within Avebury’s stone circle. The pub grub is affordable with main courses from £8.89. For one of the best selections of real ale in the county, visit The Inn With The Well, a pub with plenty of character. Pints from £3.15. Quaint Tudor wood panelling and roaring fires set the scene at The Sun Inn, where pints start from about £3. Avebury Life is a budget B&B embracing Wiltshire eccentricity. It advertises to those coming to “experience the strength and energy of the stones” or “connect with the crop circles”. Double room with en suite from £70pn. Stay in a grand farmhouse a short drive from Avebury at Blounts Court Farm near Devizes. From £35pppn, it’s a bargain. Take the train from London Paddington to Swindon from £46.30 return. Then take the number 49 bus from Swindon to Avebury (doesn’t run on Sundays).